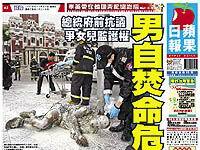 This particular story appears in Apple Daily (Taiwan), and it is extrememly graphic at the bottom. You have therefore been forewarned. This is an example of a story that the English-language media will not cover at this detail. The background of the story is this: a man with a history of schizophrenia got married six years ago with a mainland Chinese woman and they have a 5-year-old daughter. The man was unable to work after a car accident, and so the family depended on the wife working at a jewelry store. The man was also a gamber. Eventually, the wife filed for divorce as well as custody for the daughter. In August, the man armed himself with a knife, seized the daughter and threatened to blow everything up with a liquid gas canister. 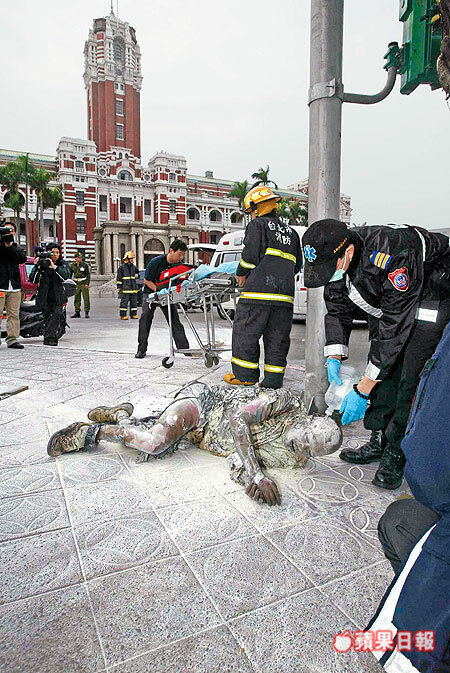 He was persauded to stop and went for medical treatment. When he came out, he found out that the court has granted a divorce to his wife along with custody of the daughter. Early yesterday, the man borrowed NT$1,000 from his mother and went out from Chiayi to Taipei. He went to look for his brother who was not in; so he told the sister-in-law: "I'll never be coming gack!" Then he left. At around 3pm, the man took a full 1,000 c.c. bottle of petrol and proceeded to the plaza about 50 meters south of the Presidential Office Building. 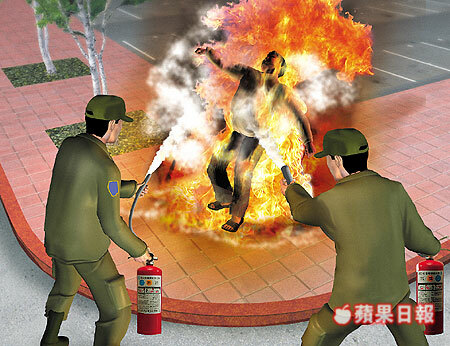 Then he doused himself with petrol and lit himself up. 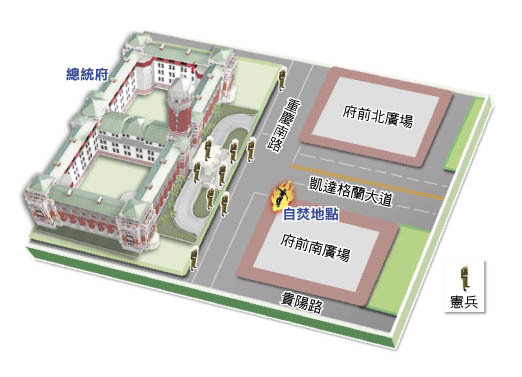 The military police sentries in front of the Presidential Office Building saw that and quickly grab fire extinguishers to douse the fire. The man was sent to the hospital. Here are the photographs. There is a map, two illustrations and then a really raw photograph.